Over 1500 students are already enrolled in the introduction to programming course. Thanks for the great response on both Udemy and Skillshare. This is a very important course for a beginning programmer. Initially when I created this course for you, I didn’t have the academic perspective in mind. To my surprise, a number of the students were new computer Science students. These students accredited the course for helping them ‘smoothen’ the learning curve for some of the courses they take. With that said, anyone can take this course and benefit from it tremendously. Anyone new to programming will greatly benefit from this course. The links for accessing the full course (On Skillshare or Udemy) are below. On Udemy, I did not split this programming course. Like I did on SkillShare. On Udemy it will be a full 5 hour course. It is comprised of short length videos (about 2 to 5 minutes in length ) . If you want to watch the course in one place, join it on Udemy using the button below. Of more importance, at any point if you have any questions, feel free to let me know on Udemy or on Facebook. Skillshare’s mantra is predicated on bite-sized learning. It prides itself in shorter classes as compared to Udemy. With this in mind, I decided to divide the Introduction to programming course into different chapters . All the chapters are linked to below. Feel free to skip to any chapter you want to join. This chapter deals with some basic concepts and definitions related to programming. You will also learn about Data Types and what they mean. 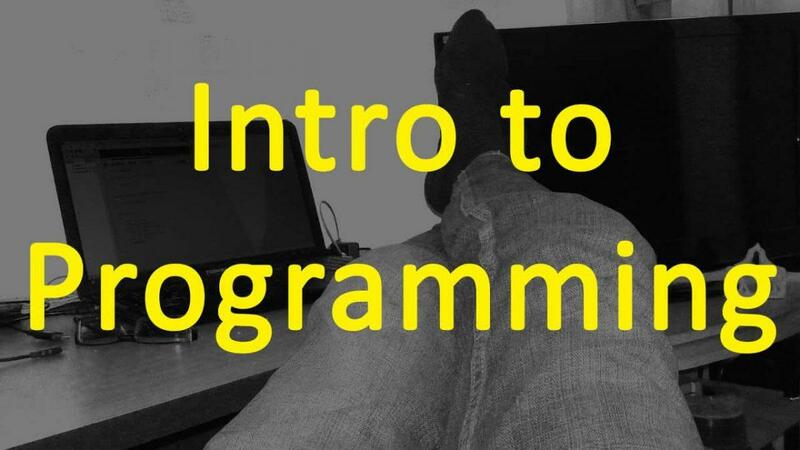 This is the welcome to the course chapter that wets your appetite into the world of programming. This chapter is free and accessible to everyone [#freeForever] using the link below. Join it using the button below. This chapter is a continuation from chapter One. This chapter will teach you about variables and constants in programming. Join this chapter via the button below. This programming chapter is a continuation from chapter two, which dealt with Variables and constants. To learn about operators in programming, click on the button below. This chapter follows chapter Three. In the third Chapter you covered Operators in great detail. In this fourth Chapter you will learn about control flow in programming. Control flow refers to the order of execution within your code. That is to say, what is executed first? What conditions need to be met for some code to be executed? And so on. In this chapter we’ll start by looking at conditional statements in programming. You will learn about different variations of the if –else statement and so much more. In chapter four we started looking at Control flow in programming. And we looked at conditional statements. In this chapter you’ll learn about Loops. Looping enables iteration in programming. In this chapter you will learn about different looping statements and how to use them. To learn about Loops in programming, join this chapter using the button below. This chapter is a continuation from chapter five which dealt with Loops. In this Sixth Chapter we shall end the Control Flow concept by looking at the Switch statement. You’ll learn how to use the switch statement . I will do switch demos in Java and C++ . And you will be able to take that knowledge and apply it in any programming language that has the switch statement. Learn about the switch, using the button link below. In the Seventh Chapter you will learn about Arrays. You will learn how to use Arrays. You’ll see me and follow along with me in doing demos for you. Arrays is one of the most important concepts in most programming languages . Click the button below to learn about Arrays. In this eighth chapter you will learn about Functions in programming. Functions is one of those things that you will encounter in almost every programming language. To learn about functions in programming, use the button link below. This is the final chapter of this introduction to programming course. In this chapter you will learn about Errors and Exceptions . You will learn the different types of errors. You will learn how to handle exceptions. And you’ll be able to carry forward the same principles you’ll learn here. At any point if you have any questions feel very free to let me know. On Udemy, you can create a new discussion in the Q&A section. On Skillshare you may also create a discussion right below the videos. Ask any of your questions on the Facebook Group for Bizanosa Courses. All the best in your learning.